We went to the downtown area where they had their annual Halloween festivities. They had trick-or-treating, a petting zoo, live music, a costume parade, a costume contest, games and prizes. The kids loved dressing up and getting candy and we liked watching them have fun. It was a little windy but nothing to stop us from having our fun and doing all the activities. 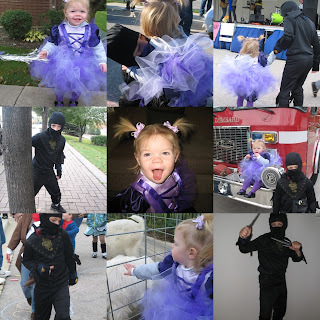 Jake was a black ninja and Olivia was a fairy princess compliments of grandma. Thanks! I wish we lived closer so our girls could be little twins! Preslie loves her costume. You can tell when we put it on her that she knows she look pretty. I finally made that Chunky Tomato Basil soup for dinner tonight. Dan and I really enjoyed it but it didn't go over so well with the kids. It is perfect for fall even though we don't really get "fall" here, it's fun to pretend. I think the soup might even be good as a sauce on pasta. I'm going to try it with the leftovers from tonight for lunch tomorrow. Thanks for the receipe!